February 24th, 1975. Kathmandu. Nepal. 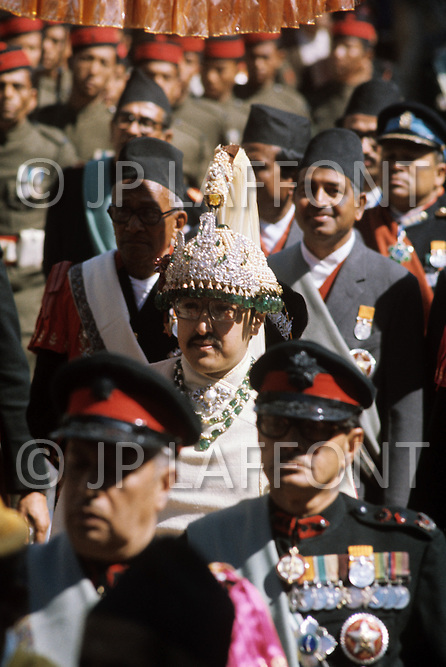 The Coronation of King Birendra and Queen Aishwarya of Nepal, on the chosen day. At 8:37 a.m., the precise moment selected by court astrologers more than a year before, the royal priest placed the huge jewel-encrusted crown on the King's head and a diamond tiara atop Queen Aishwarya's. They were both massacred by their son Dipendra on 1 June 2001. The King and the Queen taking place to the Royal parade.